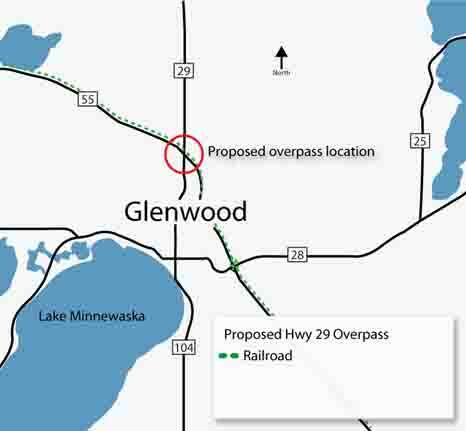 Pope County officials, with the support of the Minnesota Department of Transportation, are proposing an overpass at the junction of Hwy 29 and Hwy 55. The overpass would eliminate an “at grade” crossing with the CP Railway System. The project would also eliminate the existing and undesirable skewed intersection of Hwy 29 and Hwy 55, moving the junction south to 160th St. and giving the intersection a perpendicular approach.